The coat of arms of Chad was adopted in 1970. The center has a shield with jagged blue and yellow lines, with a sun rising over it. The shield is supported by a goat and a lion. 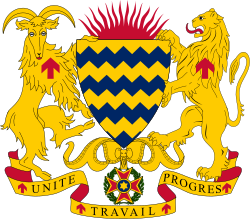 Below the shield is a medal and a scroll with the national motto in French, Unité, Travail, Progrès ("Unity, Work, Progress" in English). The shield supporters as well as the scroll feature a red arrow pointing upwards. The wavy lines on the shield are representative of Lake Chad, and the sun rising over it represents a new beginning. The goat on the left represents the northern part of the nation, while the southern part is represented by the lion. Dangling from the bottom of the shield is the medal for the National Order of Chad. There also exists a separate state seal or emblem of Chad, which has a black-and-white design consisting of a circle with the words "République du Tchad – Unité, Travail, Progrès" surrounding a depiction of the head and upper body of a tribal girl with her hair in cornrows. ^ Guide to the Flags of the World by Mauro Talocci, revised and updated by Whitney Smith (ISBN 0-688-01141-1), p. 127. This page was last edited on 6 December 2018, at 19:39 (UTC).